Florence is a magical city. The red clay rooftops, cobblestone streets, and piazzas around every corner enchant visitors once they step out the door of the train station. Artwork and architecture from some of the most renowned masters of the Renaissance (Michelangelo, Raphael, and Botticelli to name a few) adorn this beautiful city. One each visit to the city I fall in love a little more, and my guess is you will too. 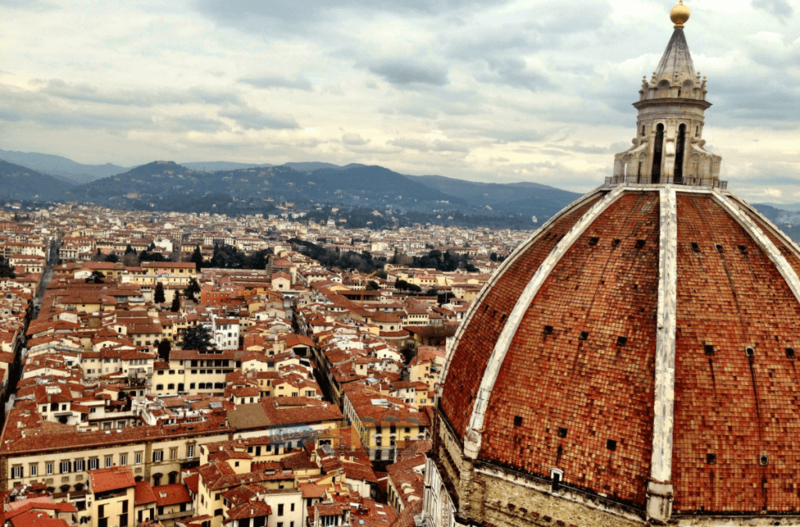 These are our favorite things to do when visiting Florence with kids. This post may contain affiliate links, which means I may receive a commission on any purchases made through clicks. However, all recommendations are my own. The Florence train station, Santa Maria Novella, is extremely manageable. If you only plan on visiting for the day (which I wouldn’t recommend, there is too much to see), there is a “left luggage” area where you can leave your bags while exploring the city. Simply present your passport at the left luggage office, pay the fee to deposit your bags, take your claim ticket and you are on your way. DON’T DO IT!!!!! If you don’t know this already, consider yourself warned. Drivers in Florence are crazy (locals and tourists alike), and there are restricted traffic zones called ZTLs basically everywhere in the central historic area. 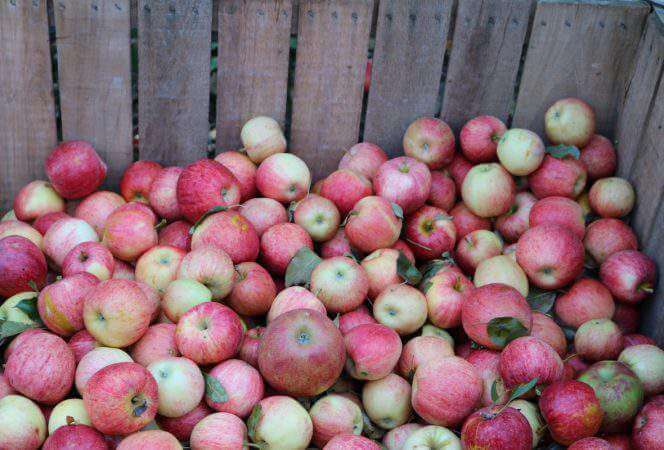 ZTLs are restricted during most of the day which is pretty inconvenient for most people. A special permit is required to drive in this area, and most tourists will not have one. There are video cameras everywhere ready to photograph your license plate should you enter “the zone”. My advice: have a taxi drive you into the city if you are coming from the airport, or pick up your rental car outside of the city center after you are finished exploring. Upon exiting the train station, walk towards the Santa Maria Novella church, look for Via de Panzani, take this to Via de Banchi and it will take you to Il Duomo in less than ten minutes. Or just follow all the tourists because odds are they are going to the same place. This is Florence’s architectural masterpiece and main cathedral. Admission to the basilica is free, but there are additional charges to visit the crypt, the museum, and the baptistery across the way. It is possible to climb to the top of the dome, but for some reason it was closed on the day we visited. 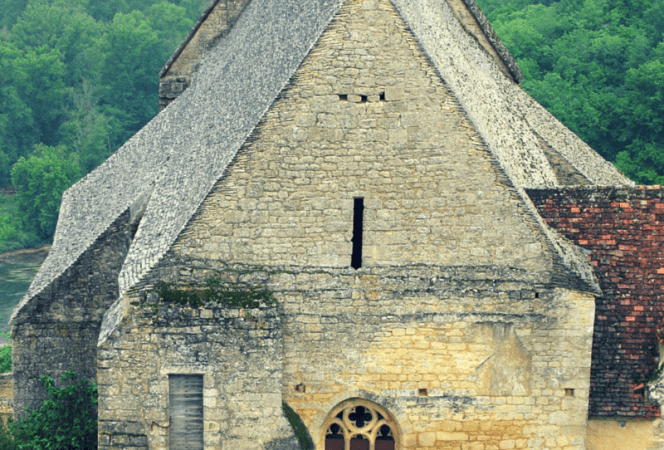 A good alternative is to climb to the top of the adjoining bell tower. My husband took our oldest son to the top of the bell tower because the wait was quite long and our youngest thought it would be a great time for a major meltdown. So I missed out climbing the 400+ steps, but the pictures prove they had a great view of the city and the Duomo. The Uffizi Gallery is home to some of the world’s most important art, lots of breakable sculptures, and crowded with people. Most people would question our sanity about taking our kids. Thankfully, our children don’t know any different. We have been exposing them to art museums since they were little, so now they actually enjoy the visit. One of them appreciates the “creativity of the artists”, the other likes the history of the works, and the youngest, well, let’s just say he’s usually likes the museum scavenger hunt I create for him best of all. 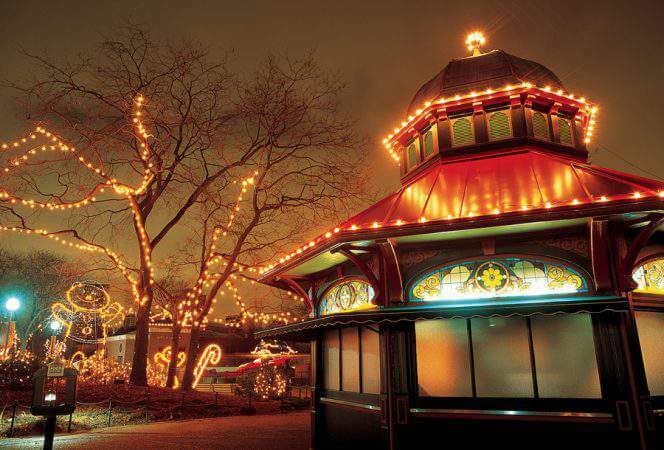 Reserve your tickets ahead of time online or you will find yourself waiting in line for hours. Make the reservation on the museum’s ticketing page and they will e-mail you a voucher. Bring the voucher with you on the day of your visit. Pick up tickets at the small office across from the main entrance and then you can bypass the long queue. Pick up a map as you enter and rent an audio guide (or better yet, download the Rick Steve’s audio tour to your cell phone). Do not plan on seeing the entire museum, instead pick out the major works you want to see and map out a plan for visiting them. To engage your kids, talk about the paintings, and help them make connections. The place is a maze, so our rule is to stay in the room we enter until everyone is ready to leave. The view from the café on the top level is spectacular, as are the views of the Arno River out the windows. Some of the kids favorite paintings include: “Doni Tondo” by Michelangelo, “La Primavera” by Botticelli and also “Birth of Venus” by Botticelli (I’m sure the naked woman has nothing to do with them liking it, LOL). Check out our guide How to Survive Museums with Kids if you need more tips. If you want to book a tour, consider the Context Uffizi Tour for Kids. 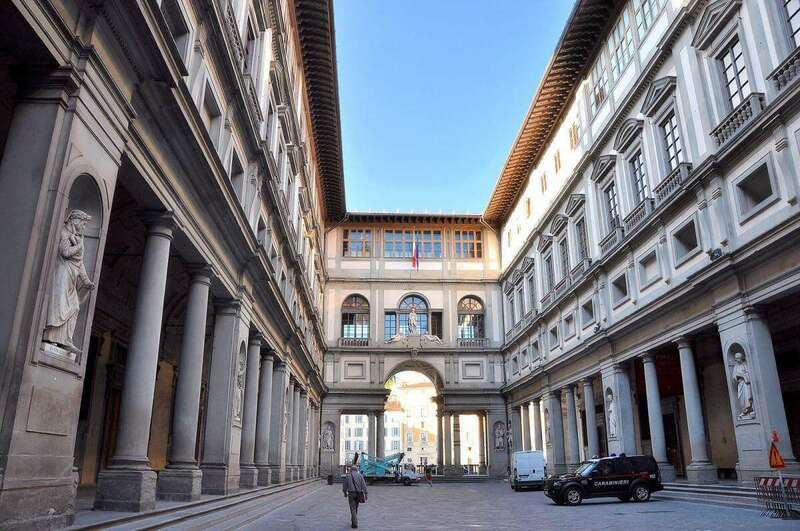 There are two Leonardo museums in Florence, this happens to be the one closest to the Duomo. The museum has replicas of most of da Vinci’s creations (if not all). Everything was hands on, which the kids loved. They really enjoyed the room of mirrors. This was a great introduction to the Renaissance inventor for kids and adults alike. 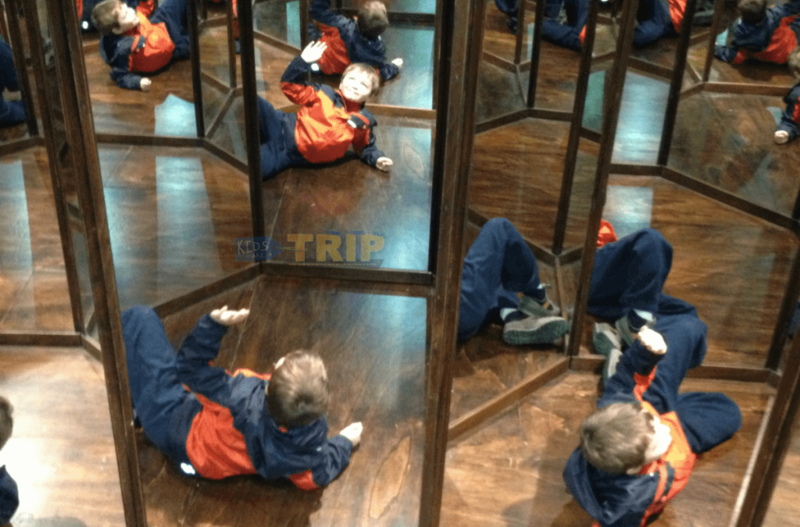 Having fun in Leonardo’s room of mirrors. Is it worth seeing the David statue and visiting the Accademia with kids? Others might disagree, but I feel seeing the statue of David is not a high priority with kids. It’s a very large statue, and the Accademia has a lot of other statues. Since we had visited on a prior trip, we decided not to take our kids. If you absolutely must have your picture taken with a David statue, there is a slightly smaller replica in the Palazzo Vecchio. Hopefully that will suffice and you will save yourself some money along the way. 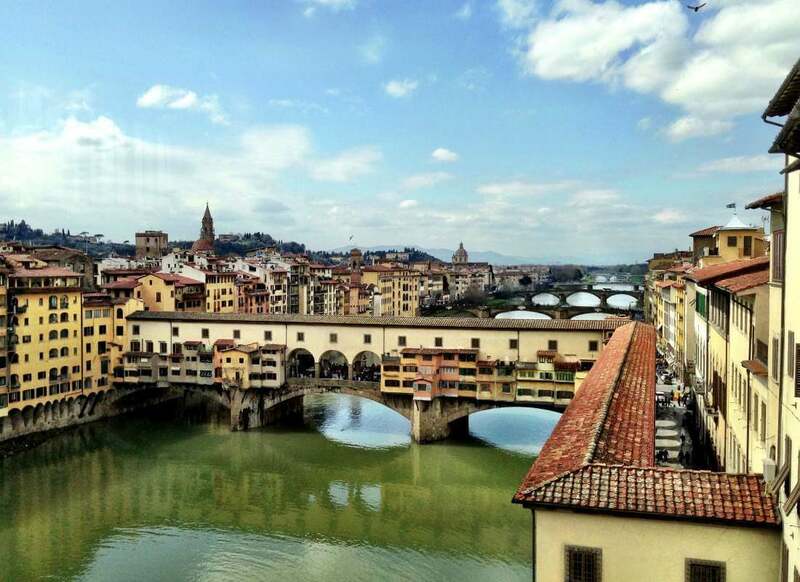 The Ponte Vecchio is the oldest bridge in Florence and many people enjoy taking photos from afar. 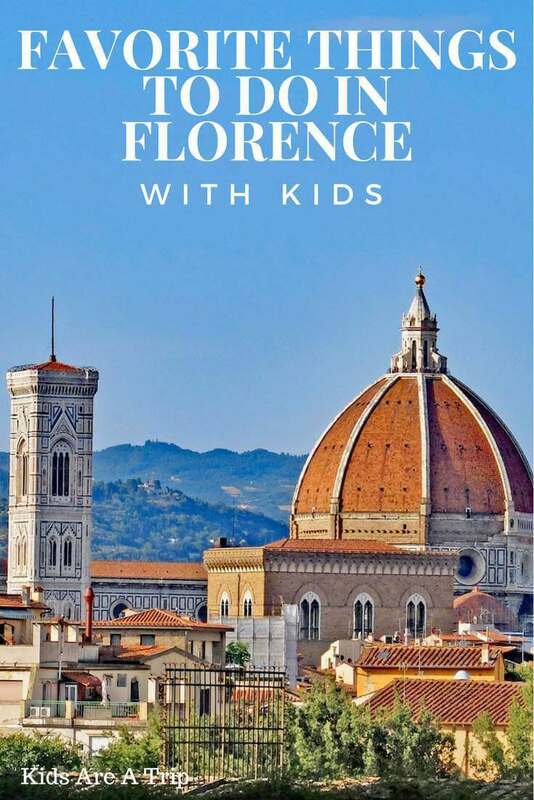 However, take a walk over the bridge with kids as they’ll love seeing the shops and it’s the easy way to reach the Palazzo Pitti and Boboli Gardens. Be sure to hold on to small hands though, because the bridge can get quite crowded! Across the river from the major tourist attractions is the Pitti Palace, one of the largest architectural monuments in the city. It is home to several major museums, but children will love the Boboli Gardens the most. The Boboli Gardens are behind the palace and provide the perfect space for kids to run around and explore. If you plan to stay awhile, pack a picnic or snacks. 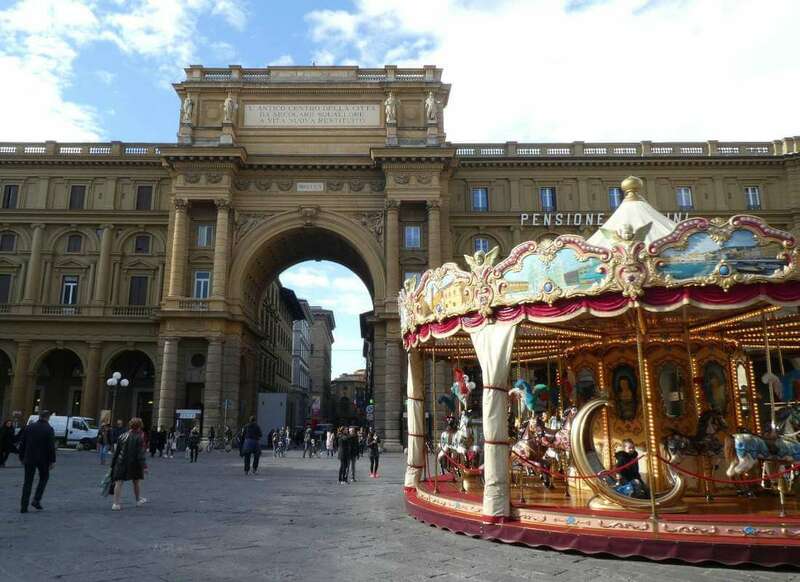 The Piazza della Repubblica is very touristy (and restaurants are very over-priced), but children will love the antique carousel in the middle of the plaza. The piazza was the city center since Roman times and through history played many roles including the home of the city market and the Jewish ghetto. It’s a beautiful space for the children to run around and not have to worry about cars. Perché No, Via dei Tavolini, 19R Around the corner from the Palazzo Vecchio, this gelateria has been around since 1939 and makes their gelato without preservatives and no artificial colors. They also have some unique flavors. Very refreshing on a warm day. Grom, Via del Campanile, 2 Right near the Duomo, this is the first gelateria I came across that had a list of all its allergens available in its store and upon further research, on its website, www.grom.it. If you are allergic to something, they can tell you which gelato to stay away from. A gelateria that cares about allergy sufferers, and delicious too! All’Antico Vinaio, Via dei Neri, 65R/-74R We happened upon this at the right time, just before the lunch time crowd. This sandwich shop is not far from the Uffizi, and is super popular. The sandwiches are baked on delicious focaccia bread and stacked in a case. You pick and choose what you want. One sandwich can easily feed two people and everything was reasonably priced. Fast food Italian style. Grand Hotel Minerva, Palazzo Gamba, Kraft Hotel, and booking an apartment through a service like HomeAway are all good options. We stayed in a vineyard about 40 minutes outside the city, Corzano e Patterno, and would highly recommend the property for those wanting to be away from the crowds! I don’t believe there is a city in the world quite like Florence, with its wealth of architecture, art, and culture. Each visit is rewarded with new discoveries and adventures unique to this special place. *This post originally appeared in November 2014, but was completely updated in February 2018.